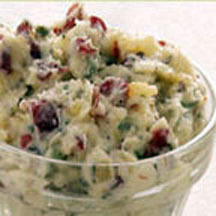 This flavorful butter is equally good with or without dried cranberries. Use it during the holidays on potatoes, vegetables or meats. It is also delicious year round tossed with pasta or as the final touch on broiled or grilled fish. In a medium skillet, melt 1 stick of butter over moderate heat. When butter begins to foam, add onion and garlic and continue cooking until butter turns a nut brown color. Remove from heat and stir in sage, salt, and pepper; cool completely. Place the remaining butter in a medium mixing bowl and, with an electric mixer, (fitted with a paddle) or wooden spoon, beat until light and fluffy. Scrape down the sides. Add the brown butter mixture and beat to incorporate, scraping down the sides. Stir in cranberries if desired.